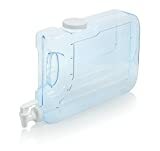 Enjoy refreshing water or your favorite beverage with our 2 Gallon Refillable Beverage Container. Perfect to dispense right from your refrigerator or to use at work, picnics, or sports fields. Re-fill and Re-use. - Ice Cone holds ice away from the drink so not to dilute while keeping everything "chill"! 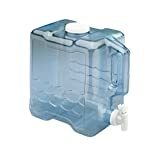 - Go sleek with this Break Resistant Beverage Dispenser that holds 3.5 Gallons of your favorite cold beverage. - MULTIPLE OPTIONS: The dispenser has 3 different dispensing volumes as well as continuos dispensing for your convenience. 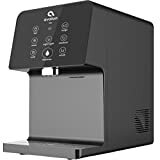 Buddeez unbreakable insulated beverage dispenser with removable locking ice-cone, lock-on base, no-drip faucet, made from BPA-free Tritan. Enjoy refreshing water or your favorite beverage with our H2O Oasis 1.25 Gallon Beverage Dispenser. Slim design is perfect to dispense right from your refrigerator or to use at work, picnics, or sports fields. .